Dr. Wayne knew from a young age that his future was in Chiropractic Medicine. Recalling the hard physical work his father put in on the family farm, Dr. Wayne remembers a noticeable difference in the way that not only his father acted but felt after visiting the local Chiropractor. But his experience didn’t stop there. During High School, Dr. Wayne experienced the benefits of Chiropractic care first hand. While playing High School football, he recalls a “searing” and “pinching” type of pain after a tough tackle. After weeks of Physical Therapy he began a recovery program through Chiropractic care and for the first time since the injury, truly felt relief and soon there after he returned to the field to play. The rest, as they say, is history. 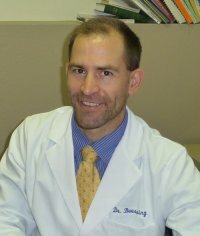 In 2001, Dr. Wayne graduated from Logan Chiropractic School and has been practicing in Colorado Springs since. Exercising a hands-on, whole-person approach to Chiropractic care is what makes Dr. Wayne Buessing stand out from the rest. Whether his patients are experiencing problems that start in the back or neck, his goal is to have them feeling better from the minute they wake up to the second their head hits the bed. Knowing that many of his patients have seemingly “unrelated” symptoms that are caused by underlying imbalances in the spinal cord, he conducts a thorough medical and personal history before treatment even begins. This approach allows him to get to the origins of pain, whether acute or chronic, and create a personalized Chiropractic and Wellness plan. Through the careful supervision and care Dr. Wayne Buessing provides, many of his patients are able to achieve not only symptomatic relief, but also a higher functioning and balanced life.